Once I landed in Houston, I grabbed a small snack at a diner and headed over to my gate, where I was going to meet with my friend Jen (and the 9 kids, 1 chaperone, and 1 parent) to wait for our flight to be called. I had two choices. I selected the steak with asparagus. The other didn’t sound interesting at all. 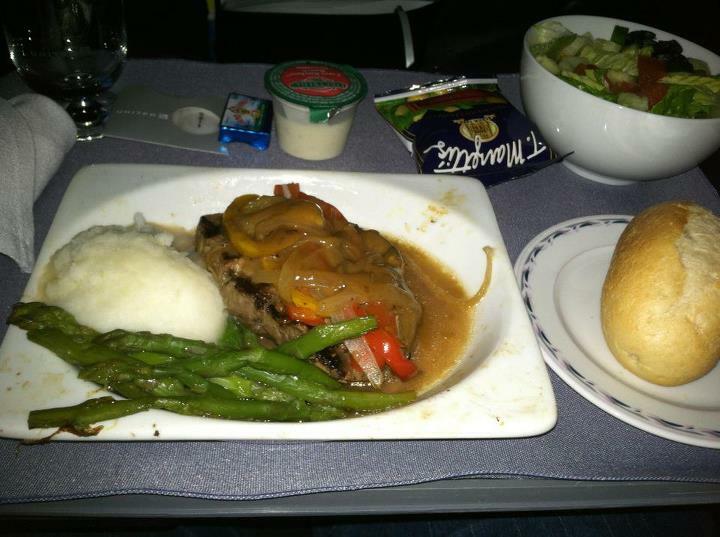 I savored this meal like none I’d savored on a plane before, precisely because I hadn’t ever had this sort of a meal on a plane before. It was amazing. I couldn’t believe that the steak was warm and tasted GOOD. The silverware was the only odd part: it was all plastic! Strange to eat steak with plastic utensils. The seat beside me had an interesting story: initially a man whose friend was two rows ahead and to the right of us was seated there. I was excited, because he spoke Spanish and “looked” like my idea of what a Guatemalan looked like. I thought we could chat and I could practice my Spanish, meet a new person, expand my horizons, etc. When it became clear that his friend’s accompanying seat was empty, the man left, saying “Sorry” to me and then joining his pals. Many of the people in First Class were native Spanish speakers and their camaraderie was palpable in the air, as they all laughed and joked in Spanish. I felt very disconnected, very “white”, very alone. The flight attendant invited a man from the Economy section to move up and he sat down next to me. He was non-descript: dark, silky hair, dark eyes, skin that was lighter than mine, jeans and a nice shirt. Very American-looking. I was disappointed. No Spanish practice, no Guatemalan encounter before I hit Guatemala, nothing to expand my horizons. Sometimes, I get to be smacked on the head by my prejudices. This was one of those moments. By the end of the plane ride I’d learned much about my seat companion. His name was Wilson. Wilson worked with a company that is connected to both Guatemala City and the USA. He had been in LA for the past few years, but was originally from Guatemala. And we landed. It was only 11 pm. We would meet our “on the ground” guide, Carlos Andres, once we passed through customs.